Preliminary plans include outreach initiatives for Tokyo 2020 Olympics. A report was presented regarding next year’s All Japan 2018 Maranatha evangelistic meetings scheduled for May 2018. 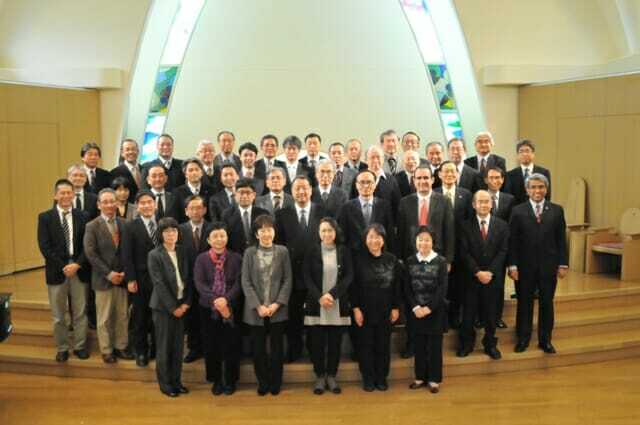 “Currently Japan has 94 organized churches nationwide,” explained leaders, “but the JUC plans to have more than 160 simultaneous evangelistic series, which is more than 1.5 times the number of organized churches in Japan!” It was reported the evangelistic series will be held not just at churches, but at companies, small groups, and institutions. Rha Myunghoon, associate pastor at Amanuma Church, the largest Adventist church in Japan, shared a report regarding the evangelism field school that was conducted this past year at the church. At the Amanuma Church, NSD ministerial association director Ron Clouzet conducted field school training during 2017. From Sept to Oct, 29 evangelistic meetings were conducted. The last time Japan conducted this many consecutive evangelistic meetings in such a short span of time was at least decades ago. Through the Amanuma Church experience, leaders said they were able to confirm that holding consecutive evangelistic meetings is still an effective method of evangelism even in this modern Japanese culture. NSD youth ministries director Nak Hyung Kim shared plans regarding the International Mission Congress that will be held next August in Korea. Japan plans to have every JUC worker and every pastor in the country attending the event. “As Japan gets involved with intense mission efforts, we hope that many more people will decide to attend the program and be inspired to do more mission work,” said Kim. In less than three years, Japan will host the August 2020 Tokyo Olympics with many visitors from around the world. The JUC plans to use the opportunity to promote the Seventh-day Adventist Church and to share the gospel. At the JUC meeting, leaders officially voted to seriously prepare for special evangelistic plans to implement during the upcoming Tokyo Olympics. “The JUC Annual Council included many business-like reports and agenda items to cover as well,” explained leaders, “but we do our best to emphasize evangelism reports and prayer throughout the meetings.” Japan has a population of about 120 million and fewer than one percent is Christian. Out of the one percent Christian, only about 15,000 are Seventh-day Adventists. Regional leaders asked the world church to keep praying for the Adventist Church in Japan. “Please continue to pray that the everlasting gospel of Jesus Christ will speedily be shared throughout the country,” they said.